I have to do some priming before I can continue assembly, but I would really like to have more parts ready to prime before breaking out the spray gun. So- I decided to move on to chapter 36 and begin prepping parts for the elevator control system. I prepped the idler arms, bell crank assembly and autopilot bracket parts - filed and polished edges, drilled and deburred holes, etc. Then I worked on the pushrods. You have to drill 6 evenly spaced holes in the ends of the push rods. The manual has a paper template that you wrap around the end of the tube. You center punch the marks on the tape to locate the holes. Even with the center punch, I have a hard time keeping the drill bit from wandering off the mark. I discovered that I could accurately get my hole demurring tool point to stay in the center punch. 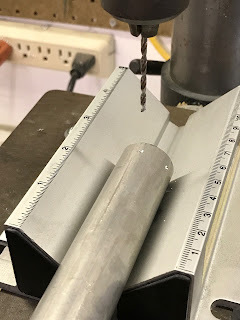 A couple turns of the deburring tool then created a nicely centered starter mark for the drill bit. I used the vee bed to center the pipe under the bit and drilled the holes. After drilling the holes #40 in the tube ends, I inserted the rod ends. Initially the rod ends are pretty loose, so I wrapped a single layer of clear packing tap around the rod ends and then inserted them. With the tape the ends fit quite snugly and I don't have to worry about them moving while drilling the initial hole. Then I drilled #30 through the tube and rod ends, clecoing after each hole so the rod end could not accidentally move. 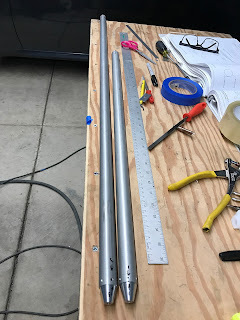 I match marked each rod end and tube and then separated the parts and deburred all the holes. I finished up today by applying some more paint to the steel parts for rust prevention. 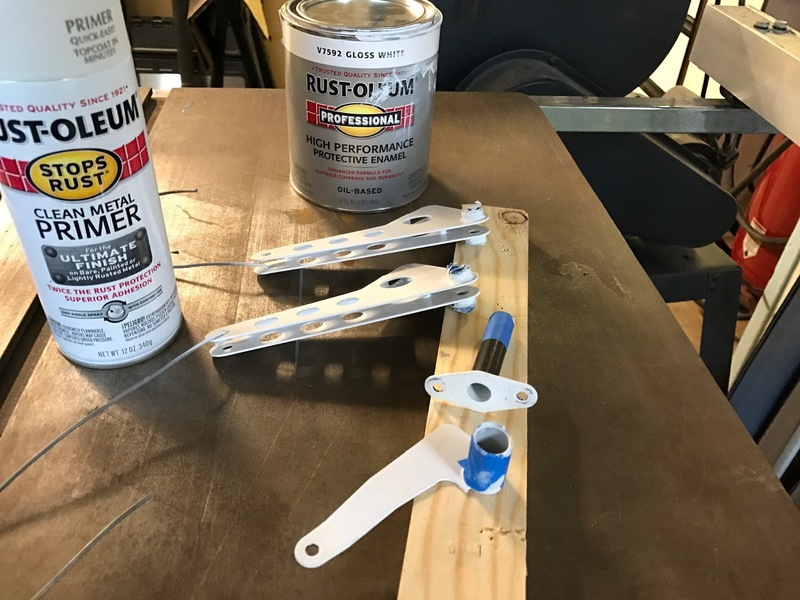 I'm priming the bar metal using the Rust-oleum clean metal primer followed with a coat of Rust-oleum gloss white enamel.